At ten o’clock in the morning on a late October day, I stand alone among the tombs lining a dirt path at the edge of Pompeii. The Porta Nocera necropolis, named for the gate at its center, remains home to the mausoleums of Pompeian citizens with enough money to construct monuments which stand taller than any passerby but neither noble nor rich enough to place their tombs along the elite road of the Porta Ercolano necropolis. 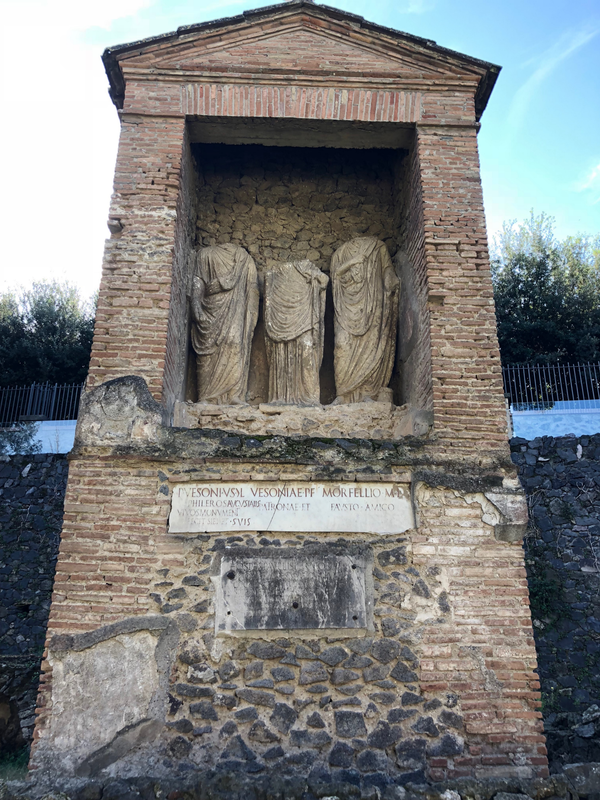 As I proceed down the path, exploring this seldom-trod section of the city, an impressive structure to my left catches my eye—the tomb of Publius Vesonius Phileros. Publius Vesonius Phileros, Freedman of Gaia, Augustalis, built this monument during his lifetime for himself and his own. For Vesonia, daughter of Publius, his patron, and Marcus Orfellius Faustus, freedman of Marcus, his friend. From left to right stand Publius Vesonius Phileros, Vesonia, and Marcus Orfellius Faustus, each identified by their social status. Both Publius and Marcus are labeled with an L, the abbreviation for libertus, freedman. Unlike Publius and Marcus’, Vesonia’s title is inscribed in full—patronae, patroness. These two words, libertus and patrona, appearing on this one tomb, immediately clue me into the unique nature of this tomb. Together, they transform this spot into my favorite within the necropolis, shedding light on two core populations of the ancient Roman world that we seldom, if ever, access first-hand—freedpeople and women. We know that Rome was built and run largely by enslaved people, yet we possess little ability to access details from their lives. We make assumptions that certain sections of Roman homes were reserved for enslaved people, yet we lack much knowledge about the experiences of these pivotal members of Roman society. We often look to stories like Trimalchio’s Dinner in Petronius’s Satyricon for clues into this veiled facet of society, yet Petronius’s drastically satirized and hyperbolic glimpse into the extravagant life of Trimalchio, a freedman, leaves us helpless to resolve what depicts reality. However, here, at the tomb of Publius Vesonius Phileros, we get a unique glimpse into the life of a freedman as he wanted us to view him. The most fascinating part of exploring an ancient necropolis is the knowledge that in reading the inscriptions, we are participating in a key part of the ancient world. The ancient Romans placed their tombs along roads into and out of major cities not only because sanitary and religious laws mandated that they bury their dead outside the city walls but also because they wanted visitors to read about the lives contained within and carry their memory along their travels. Tombs and their inscriptions, especially for people deemed unworthy for immortalization in written history, provided an unparalleled final opportunity for ancient Romans to advertise a successful life filled with accomplishments. 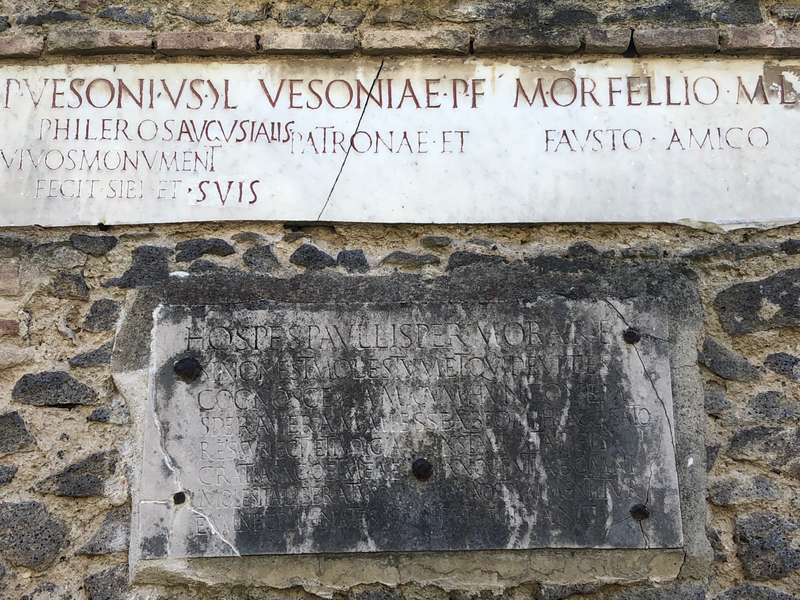 Even before we read his inscription, we can identify Publius Vesonius Phileros as someone who lived in Pompeii and acquired enough wealth to construct this monument. When we read further, we learn of his former enslavement under a woman, Gaia. He reveals an impressive dichotomy between his humble beginnings and culminating success as an Augustalis, the highest public office attainable for a freedman. This snapshot of his life remains preserved alongside the statues of Phileros himself, his patroness, and his friend. Depicted wearing a toga, Phileros commissioned this tomb to proudly display his achieved status, made possible by the woman he once called domina. In the adjacent inscription, Phileros reveals the identity of Gaia. As a freedman, he took his name, Publius Vesonius, from that of his previous owner. In beginning the second inscription with Vesoniae, he reveals that this woman is of the same family as his owner. Since we know a woman, Gaia, from the Vesonius family, freed Phileros, it follows that the Vesonia inscribed here is, in fact, that woman. Vesonia, the daughter of Phileros’ previous owner, Publius Vesonius, both frees Phileros and helps him navigate society as his patroness. Women represent another hidden population of the Roman world. Our knowledge of women in ancient Roman societies is reserved to the wealthiest women from the most noble families. We associate Rome with women like Livia, the wife of Augustus, the first emperor of Rome. We see Livia depicted in statues in countless museums across the world. Even in Pompeii, the life of Eumachia, a priestess of Venus born into an elite family, is preserved through the Eumachia Building in the middle of the Pompeiian Forum. Eumachia herself constructed this building and her clients even placed a statue of her likeness within. She also commissioned the largest tomb in Pompeii, located in the less renowned Porta Nocera necropolis because the one near the Porta Ercolano did not contain enough space to house the monolith! Through Vesonia, however, we see the distinct life of a middle to upper-middle class woman. Wealthy enough to provide opportunity to a successful client like Phileros yet lacking any known buildings or major roles in the city, Vesonia excels in a seldom-discussed role of women in ancient Roman cities, a patroness. As a patroness, Vesonia would have acted as a financial, social, and political benefactor to Phileros. To do so, she would have needed to maintain some form of financial, social, and political expertise herself. Her presence on this tomb in writing and in stone, therefore, honors her as a successful woman, cluing us into only one of the social possibilities available to women in Pompeii. Stranger, delay a moment if it’s not a bother and learn what you should avoid: this man whom I had hoped was my friend brought me to court. The facts were exposed and justice restored. I thank the gods and I have been freed from all damage to my innocence. Let neither the household gods nor those below receive the man who speaks falsely about our affairs. If we delay a little while, as this inscription instructs us, we hear a tragic tale of friendship worthy of a soap-opera, or perhaps more fitting, a Jerry Springer episode. Phileros, the dedicated client and benefactor of this tomb, immortalizes that the man he once called amicus, friend, is nothing more than a cold-hearted backstabber. But who could this man be? A third name is written beside Phileros’ and Vesonia’s on this monument—Marcus Orfellius Faustus. Like Phileros, he was a freedman, and, like Phileros, he is depicted togate in the farthest statue to the right of this tomb. His initial inscription reads thus: “To Marcus Orfellius Faustus, freedman of Marcus, friend.” This, readers, is perhaps the most shocking plot-twist to ever grace the necropolis of Pompeii. Phileros refuses to waste letters on repeating a name, but the amicus who he slanders can be none other than Marcus Orfellius Faustus. The evidence becomes even more damning in the precinct behind the tomb. This area should contain the remains of Phileros, Vesonia, and Faustus. What we find, however, are the remains of Phileros and Vesonia alongside the remnants of a third plot sealed and covered with its tombstone removed. Not only was the fallout between Publius and Marcus ultimately devastating for them both, but Publius made sure it remained publicly known for eternity. To this day, he invites every person who strolls past his tomb to learn from his own experience what comes of false friends—a reminder and a warning. Personally, I could care less whether Marcus is actually guilty of this gross offense to friendship. What matters is that I, and any other person who reads this inscription, will always remember him in that light. This is the power of funeral monuments. What people represent on their tombs serves as a final picture of whatever part of their life they most wanted us to remember. It provides unparalleled insight into who they were, allowing us to engage with antiquity in such a unique and intimate way. Publius’ tomb holds special significance to me because I see within it the life of a freedman, his patroness, and his ex-best friend; every other tomb reveals something special as well. Even today, when I walk through the gorgeous cemeteries in my hometown, New Orleans, I glean bits of life from the dead around me, and in those moments, I sense an incomprehensible feeling that among the dead, I experience life in a new way. Samantha Morris graduated as a Newcomb scholar with a B.A. in Latin from Tulane University in 2018. While at Tulane, she published a case study on the Women’s Classical Caucus and presented her thesis on women’s roles in Catullus 64 and Statius’s Achilleid. When not engaged in Classics, Samantha enjoys attending Broadway productions and eating beignets in her hometown of New Orleans.